Aberdeen were double award winners at the PFA Scotland player of the year awards. Boss Derek McInnes was voted manager of the year, beating Celtic's Neil Lennon, Stuart McCall of Motherwell and St Johnstone's Tommy Wright. 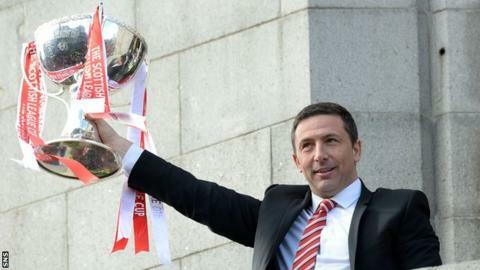 McInnes guided the Dons to victory in the League Cup final in March - Aberdeen's first trophy since 1995. Winger Jonny Hayes won the goal of the season award for his long-range strike against Celtic in February. That impressive effort came in a 2-1 win for the Dons and they currently occupy second place in the Scottish Premiership, in firm contention for a Europa League qualifying place. Aberdeen also reached the semi-finals of the Scottish Cup in McInnes's first full season in charge. Reflecting on his award, McInnes said: "It is testament to the effort of the players, it shows what can be done with a hungry group of talented boys. "My assistant manager Tony Docherty has been invaluable to me, and the rest of my staff, so the award is as much for them as for me. "We have had a lot of awards this year, a lot of plaudits so I think that shows how where we have come from as a club and hopefully this time next year there will be something similar again. "The cup win was needed by the club and the city, the players have enjoyed that success and I think that has whetted their appetite to be successful in the cups again. "We can't be satisfied with what we have done, I would like to think there is still more to come from us. "We are not obsessed with finishing second, we just wanted to make sure we improved but now that we are here, with three games to go we want to secure European football. "Hopefully we can get the points to get European football and if we can move on to second then so be it."